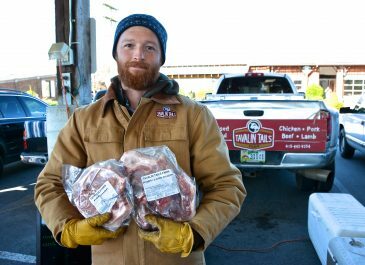 Owners Brandon and Amy Tavalin of Tavalin Tails Farm raise pure bred registered Katahdin sheep, beef, pork and chicken on certified organic land in College Grove, Tennessee. Amy and Brandon, with their young son, Adam, care for the livestock. They strive to have the best naturally and humanely raised animals in Tennessee for meat and breedstock. We offer a meat CSA including lamb, beef, pork and chicken. Cows, Pigs and Sheep are also available for purchase with whole or half animal or for registered breedstock. Please contact us for more information on our email at tavalintails@gmail.com or phone number (615) 772-3394. LAMB IS THE BEST i ever ate it is Tender and Tasty!